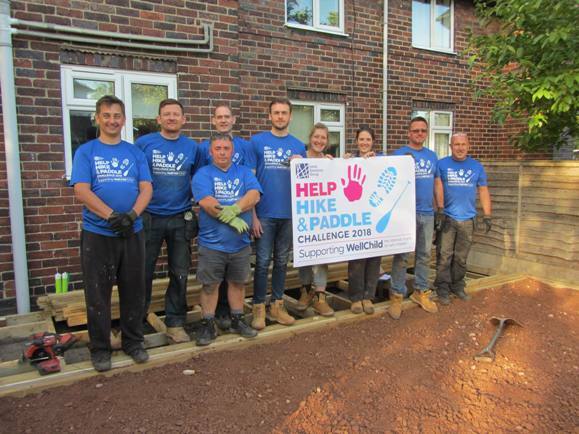 Leeds-based specialist enabling works provider, Rhodar, has delivered a £10,000 donation to WellChild, the national charity for children with exceptional health needs, through its “Hike & Paddle” challenge. The company, which is part of the Lexia Solutions Group, and its employees also donated time to help transform the garden of a family home in Stoke-on-Trent, creating a safe environment for three-year-old Amir, who is autistic. This year’s donation to WellChild continues the support Rhodar has provided to the charity over the last two years, having raised £10,000 through its previous ‘Help & Hike’ project in 2017, and bringing the company’s total fundraising for the charity to £20,000. 28 members of staff and five Rhodar clients gave up their spare time to take part in the “Hike & Paddle” challenge, which saw teams compete to get to checkpoints and solve puzzles before returning to home base – Patterdale Hall in the Lake District. Taking place on Ullswater and across hiking trails including the spectacular Place Fell (2,155ft), teams competed to complete as many puzzles as possible within a time limit, spending hours out on the water and navigating their surroundings. The second part of the challenge, The “Helping Hands” Garden Project, saw a different team, made up of Rhodar personnel from across the country, come together in partnership with WellChild to transform Amir’s garden into a safe and inspiring space. Amir loves being outside but has no sense of danger and lives near to a main road. The team created a large area of wooded decking and a substantial artificial grass area including a chalk and number board and an educational tin-can alley game to give Amir an exciting place to play. Dozens of tree roots were also dug out of a large side garden and tonnes of fresh topsoil and grass seed were also applied which should result in a lush green garden for the family to enjoy over the coming months. Jason Davy, CEO at Rhodar, said: “The team all worked really hard across both of these projects and it was brilliant to see such a competitive spirit among everyone. I am thrilled we were able to raise thousands of pounds for such a well-deserving cause. WellChild creates inspiring projects throughout the country, which are selected by need and merit of the families who apply. The charity’s vision is to provide every child and young person living with serious health needs the best chance to thrive – properly supported at home with their families. Rhodar takes pride in its support for many worthy causes. Since 2014, Rhodar has donated over £50,000 to charity, completing numerous events and challenges including ‘Big Bad Bike Rides’ and the “Wild Warrior Mud Challenges”.